Speechwriting is something of a black art, so I always leap at the chance to read any book that sheds light on the topic and might help us at Editor Group, as humble practitioners. 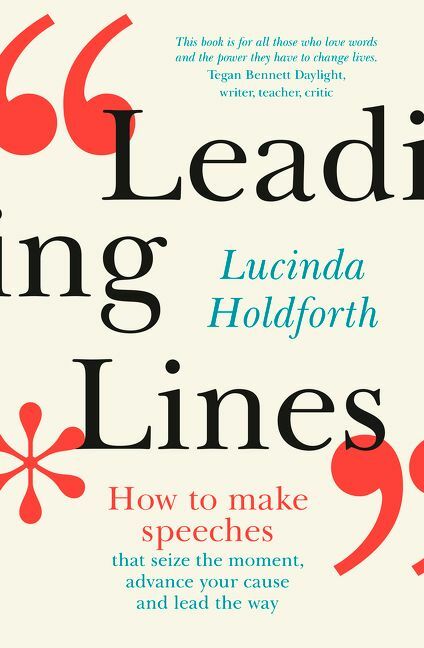 Leading Lines is a new book by the appropriately named Lucinda Holdforth, who teaches at the University of Sydney and University of Technology Sydney. She also has extensive experience writing for politicians, including former Deputy Prime Minister Kim Beazley, and the likes of former Qantas CEO Geoff Dixon. A speechwriter is, first and foremost, a writer. And every writer writes to change the world. It then dives into a more workmanlike discussion of speeches, their role as a leadership tool and practical advice for both speech-givers and speechwriters. I haven’t completely finished Leading Lines (hey, this book club promises to tell you what we’re reading, not what we’ve finished). But I can say it’s an enjoyable and valuable read, and certainly worth the $35 for those with an interest. My only complaint is that I would like to see more of Holdforth’s own material as opposed to well-covered speeches such as those by Martin Luther King and John F Kennedy. However, it’s clear that she wants to provide a comprehensive overview of the topic along with her own story and practical advice. In this territory, I would also recommend The Art of Speeches and Presentations by Philip Collins, speechwriter to former British Prime Minister Tony Blair. And the brilliant (if rambling) Recollections of a Bleeding Heart, in which Don Watson discusses his work as a speechwriter for former Australian Prime Minister Paul Keating.